The fourth pair in my Frame Earrings Series took a different direction from the others and uses two different pieces of beadwork for each earring and two separate pieces of wire. 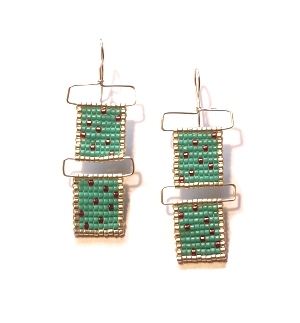 One piece of wire joins the beadwork and one piece turns them into earrings. I also broke away from the stripes and blocks used in the previous pieces and I added in seemingly randomly dots of colour. The dots aren't actually random, as I wanted to ensure I didn't have more than one dot in each column per piece of beadwork.